From the Manufacturers Label: Intensive Nourishment for Skin, Hair and Nails with: – Collagen (4,000 mg) – Biotin (2,000 mcg) – Silica (6,000 mcg) – Vitamin A,C and E Strawberry and Kiwi Flavored Concentrated Drink Mix Collagen may be the most important element of human skin. This complex protein makes up nearly 80% of skin and provides structure, elasticity and protection, while helping to retain moisture within the deep dermal layers. This is a truly unique and innovative product. Simply mix one concentrated liquid tube into 16 ounces of water per day. 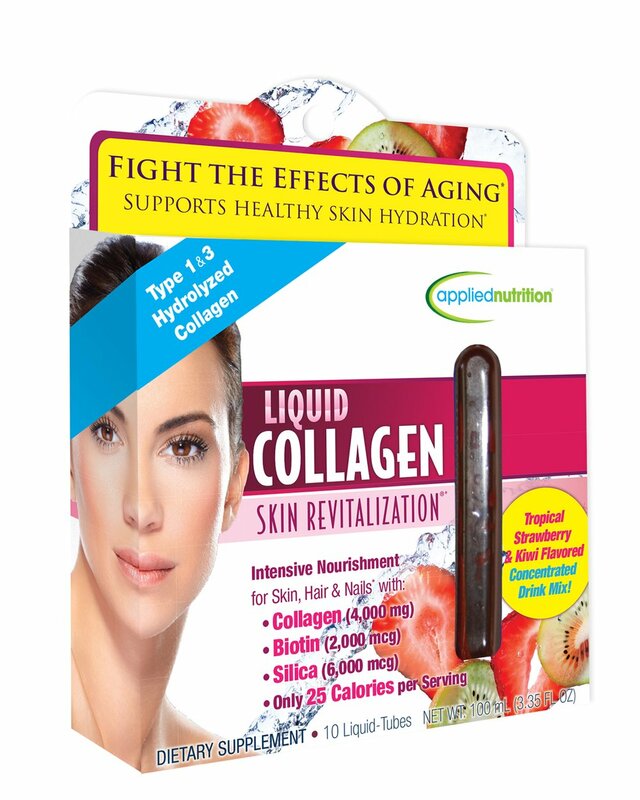 Each great tasting liquid tube delivers superior levels of collagen, plus a broad spectrum of antioxidants and nutrients such as biotin and silica, to help the skin from the inside out. Manufactured by Applied Nutrtion .